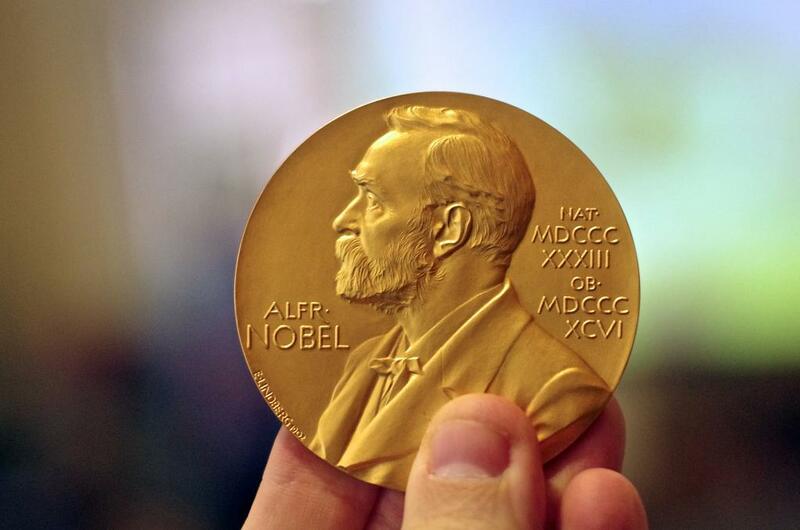 This year’s Nobel Prize in Physics was awarded to three UK-born American scientists for their work on condensed matter physics. Their theoretical discoveries on exotic states of matter such as superconductors, superfluids and thin magnetic films is set to pave the way for new inventions in the fields of materials science and electronics. One half of the prize amount—eight million Swedish kronas—was awarded to David J Thouless from the University of Washington, Seattle. The other half was awarded jointly to F Duncan M Haldane from Princeton University, New Jersey and J Michael Kosterlitz from Brown University, Providence. The most common states of matter are solid, liquid and gas. But at extremely high or low temperatures, matter assumes other, more exotic, states. For instance, when Helium is cooled to -271 degree Celsius, it starts climbing up the walls of its container and creates a vortex without slowing down. These are all properties of a superfluid—a fluid that can flow without the loss of kinetic energy. At these low temperatures, quantum physics suddenly becomes visible, unlike in solids, liquids and gases, where quantum effects are hidden by random atomic movements. What the winners of the Nobel did was to use topology—the branch of mathematics that describes properties that change in integral steps—to explain phase transitions in these exotic states of matter. Such phase transitions are called topological phase transitions and the states of matter that are invariant under these topological transitions are called topological states of matter. Thors Hans Hansson, member of the Nobel committee, tried to explain the concept of topology during the awards’ announcement by pulling out a cinnamon bun, bagel and pretzel from his bag. He explained that, despite their similar tastes, the three food items are topologically different –a cinnamon bun has no holes, a bagel has one and a pretzel has two. Number of holes is, then, a topological property. In the same way, a bun and a saucer, a bagel and a cup, and a pretzel and a pair of spectacles, regardless of the obvious differences between them, are topologically invariant. Kosterlitz & Thouless used topology to study phenomena on surfaces or inside extremely thin layers that can be considered two-dimensional. The phenomenon that Thouless described theoretically is the quantum Hall effect, in which he studied a thin conducting layer between two semiconductors, where the electrons were cooled to a few degrees above absolute zero and subjected to a strong magnetic field. The electrical conductance in the layer appears to only be able to assume particular values. When the magnetic field changes enough, the conductance of the layer also changes, but only in steps—reducing the strength of the magnetic field and making electrical conductance twice as big before it triples, quadruples, and so on. Thouless found out why by using topology. Haldane, on the other hand, studied matter that forms threads so thin they can be considered one-dimensional. He demonstrated that a magnetic atomic chain formed of even magnets is topological, while a chain of odd magnets is not. “The discoveries illustrate, in a very nice way, the interplay between physics and mathematics,” said Hansson, adding that they will pave the way for inventing materials for conducting electricity and spin. It may even aid transfer of information through quantum entanglement. “Who knows, the future may hold promise of the invention of quantum computers with significant topological effects,” he said.